1) To Draw the Bisector of a line segment. 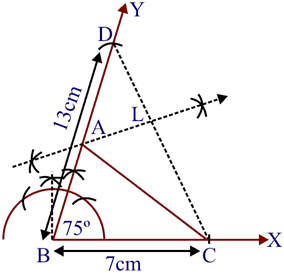 Example: Draw a line segment 5.8 cm long and draw its perpendicular bisector. Construction: 1: Draw a line segment AB=5.8 cm by using graduated ruler. 2: With a centre and radius more than half of AB, draw arcs, one on each side of AB. 3: With B centre and some radius as in step 2, draw arcs cutting the arcs drawn in step-2 at E and F respectively. 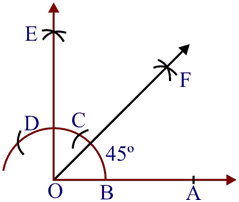 4: Draw the line segment with E and F as end Points. 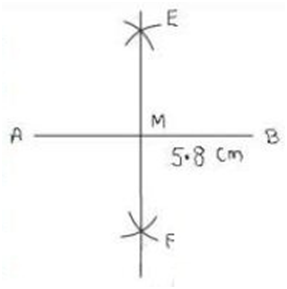 The Line segment EF is the required perpendicular bisector of AB. 2) To draw the bisector of a given angle. Example: Construct an angle of at the initial point of a given ray and justify the Construction. Construction: 1: Draw a ray OA. 2: With O as centre and any suitable radius draw an arc cutting OA at B. 3: With B as centre and same radius cut the previous drawn arc at C and then with C as centre and same radius cut the arc at D.
4: With C as centre and radius more than half CD draw an arc. 5: With D as Centre and same radius draw another arc to cut the previous arc at E.
3) Construct an equilateral triangle, given its side and justify the construction. 2: With B and C as centres and Radii equal to BC=4.6 cm, draw two arcs on the same side of BC, intersecting each other at A. 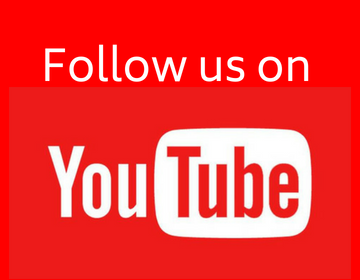 3: Join AB and AC. Therefore is an equilateral triangle. 4) Construction of a triangle when its Base, Sum of the other two sides and one base angle are given. 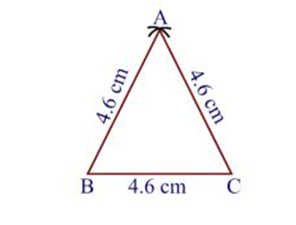 Example: Construct a triangle ABC in which BC = 7 cm, and AB + AC = 13 cm. 3: From BY, cut off BD = 13 cm. 5: Draw the perpendicular bisect of CD, intersecting BA at A. The triangle ABC thus obtained is the required triangle. 5) Construction of a triangle when its base, difference of the other two sides and one base angle are given. Example: Construct a triangle PQR in which QR = 6 cm and PR – PQ = 2 cm. Construction: 1: Draw a QX and Cut off a line segment QR= 6 cm from it. 3: Cut off a line segment QS = 2cm from QY'. 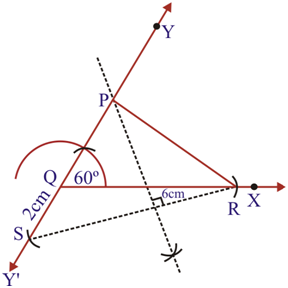 5: Draw perpendicular bisector of RS intersecting QY at a ponit P.
Then PQR is the required triangle. Message *I really like this website . It is really helpful to me and for others. I love this website. The notes are really helpful and understandable, even the complete set of questions are useful. I found this site amazing amazing!!!!!!!!!!!! !